There is always a conundrum if you are a bit of a creative cook – do you stick with the absolutely traditional recipes or do you try to ring a bit of a change? Things cannot be fixed in aspic – and after all, who eats aspic anymore? I rest my case. In a way, food is very similar to language, it adapts and moves, shifts and changes according to taste and fashion; it is a totally natural process. A change in slang and idiom is as natural and refreshing as an avocado and quinoa salad; it is after all evolution and no one would want to stop that. A new recipe is a new recipe but some things are so absolutely right as they are, that you can’t possibly mess around with them. It makes me think of Google translate – it’s fine if you want to get the gist of something but it’s never going to make you sound like a native. In a way, part of my gripe is with the celebrity chefs. They set out on some sort of odyssey to discover the real food of a region or nation and it’s all fine until they set foot in a kitchen. Then there is Jamie Oliver cooking a ragú al fresco in Tuscany, or Rick Stein rustling up curry in a jungle bungalow. It is all great and I am definitely a sucker for it too. It’s just that when they start to cook food from foreign parts that you know intimately, you realise that it’s all going …well… off piste. So there’s Rick in a gorgeous kitchen in Symi. We catch a glimpse of the Aegean – a splash of an ultramarine bay glistening through the half-shuttered windows – and he cooks the classic of all classic, Greek dishes, avgolémono soup. 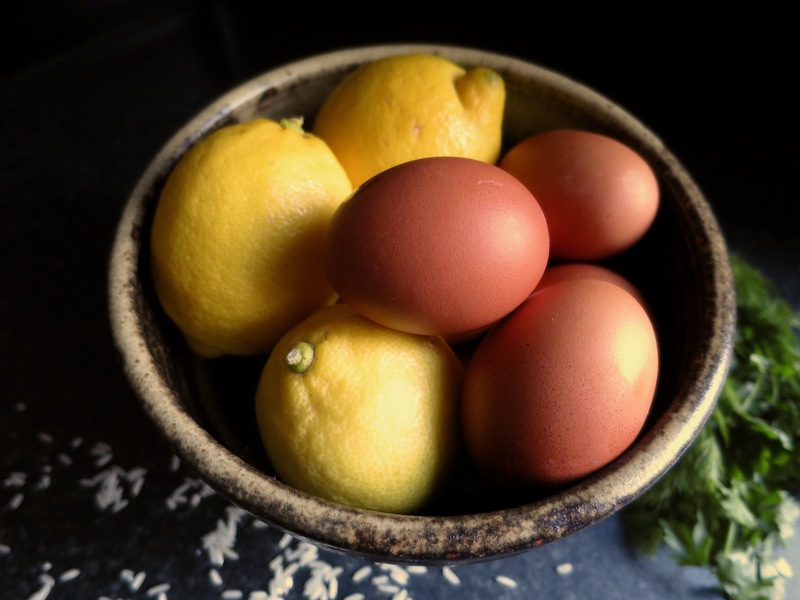 Avgolémono is a made from chicken broth, with a little rice in it (NOT orzo pasta) and is thickened with a creamy emulsion of eggs and lemon juice. I hate to diss Rick; above all I love his enthusiasm for simple, authentic Greek food. So why then, and since when, did avgolemono soup EVER have a whole poached egg in it ? Rick, get a grip ! 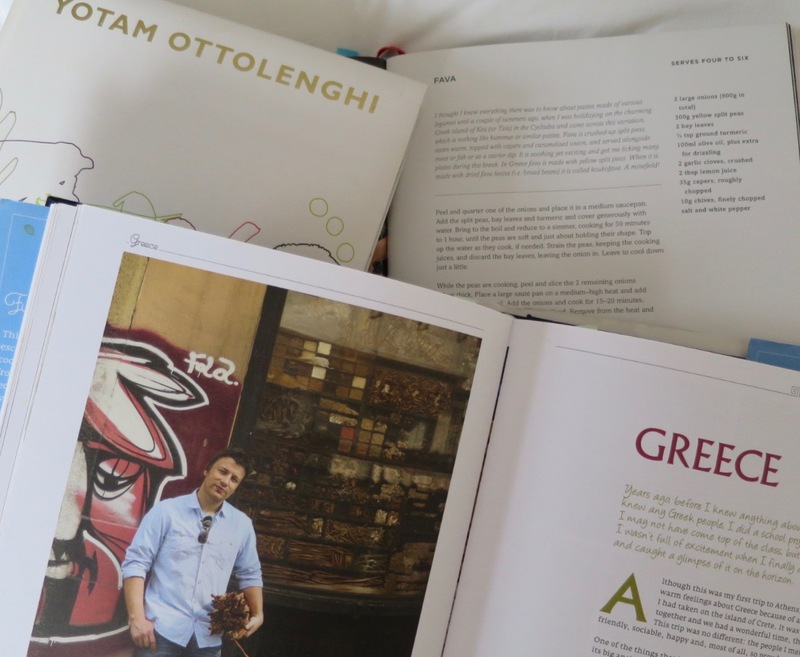 Greek cooking is in the limelight in a way that, as an ‘old timer’, I have never seen before. It’s good to see manoúri cheese in my local supermarket, I can buy several brands of feta just about anywhere and kalamata olives are accepted as the go-to of the fruit. This is a fantastic development that philhellenic foodaphiles have been waiting for for years. But Jamie, you can’t put pistachios and chilli in Greek stuffed vegetables, and Yotam, I know you want to make your mark, but I don’t want turmeric in my fáva ! So , I am in my local Waitrose and I catch sight of a ‘ready meal’ that I was not expecting – pastitsio. Closer inspection brought nothing but total disappointment and, to be frank, outrage ! 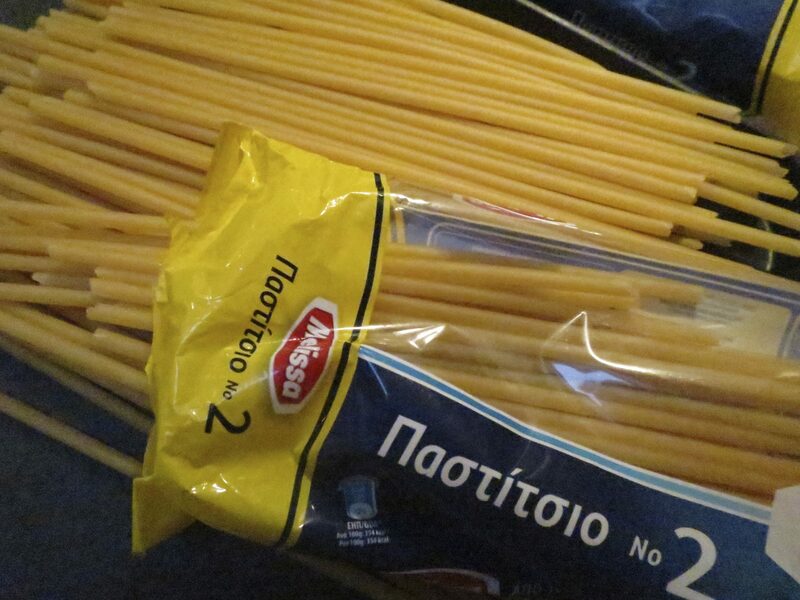 Let me just explain about pastitisio. I’m not going to make paella with pasta, and I’m not going to make toad in the hole with chorizo sausage. 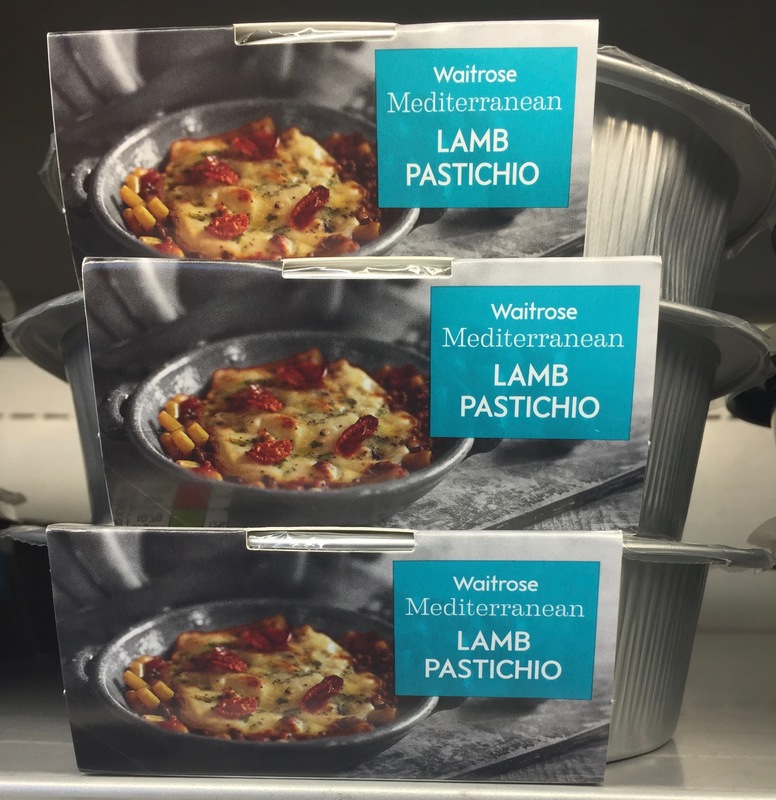 You wouldn’t make shepherds pie with pork mince, so why did the chefs at Waitrose think that you can possibly make pastitsio with lamb ? Oh, I forgot ! ALL Greek dishes are made with lamb !!! Well, that’s only if you have absolutely NO idea about Greek cuisine. Pastitsio is made from a ragout of beef mince, flavoured only with sautéed onions and parsley. It includes tubular ziti pasta, arranged in an absolute linear fashion, and fragrant, cinnamon-infused béchamel sauce. That’s it. So, chefs, celebrity, supermarket, or otherwise – stop it ! Get your hands off the classic recipes and just cook them as they should be. Then I might possibly consider buying a Waitrose pastitsio. In the meantime, here’s the real recipe and lamb is not on the list of ingredients. 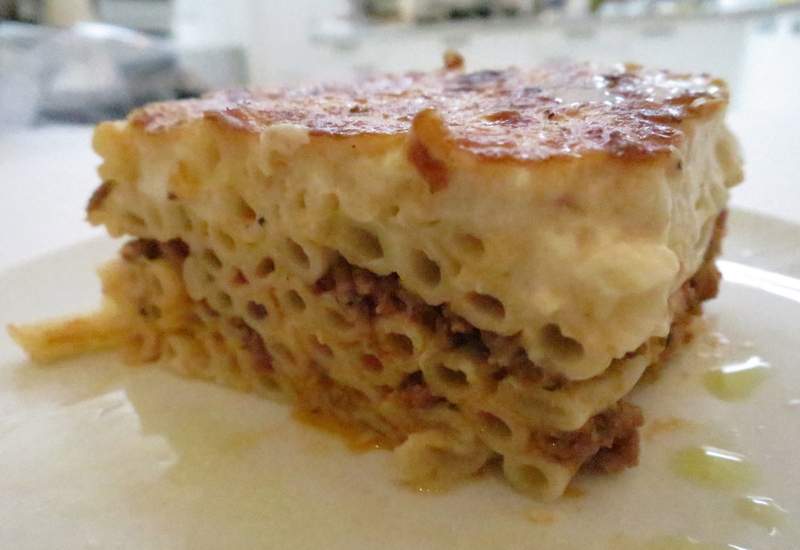 Pastitsio is made up from three separate elements, meat sauce, béchamel sauce and cooked pasta. It makes things easier, if you can, to make the meat sauce the day before assembling and cooking the completed dish. Heat the olive oil in a saucepan, add the chopped onion and cook until it has started to soften. Add the mince and cook until it starts to brown, stirring it all the time so that the mince breaks up and doesn’t cook in lumps. Add the tomato juice (or tomato purée and water), the wine if you are using it, the chopped parsley, bay leaf and cinnamon. Mix well. Turn the heat down and simmer for about 35 minutes. You want to end up with a fairly thick meat sauce. 150gm grated kefalotyri or parmesan. You will need an additional 100gm for topping off the finished pastitsio. In a large pan, heat the milk, along with any spices or seasoning . 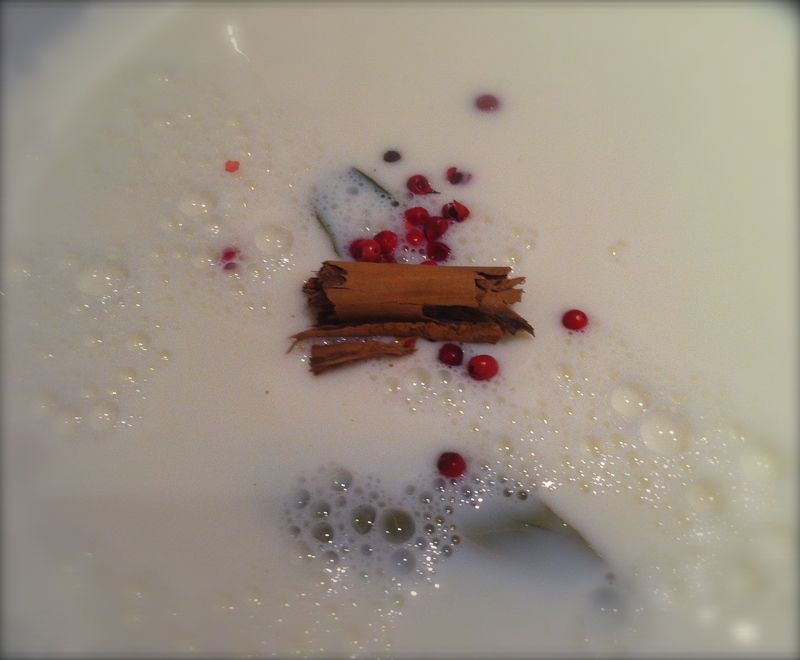 If you have the time, it is good to do this a little ahead and heat the milk with a bay leaf and some whole peppercorns. Allow it to steep a little; the added fragrance is worth the effort. In another pan, one that is big enough to take the warm milk, melt the butter. Lower the heat and now add the flour, stirring constantly. Over a low heat, allow the flour to bubble a bit but do not stop stirring – it burns very easily. Take the butter/flour combination off the heat and gradually, one ladleful at a time, add the warm milk, incorporating each spoonful before adding the next. Once that is done, return the pan of milk/butter/flour mixture to the heat, stirring constantly until it thickens to the consistency of thick custard. Remove from the heat and add the ground cinnamon and ground pepper. Add the grated cheese and stir well. Put the pan to one side to cool. This is your béchamel sauce. When it has cooled down really well, add the beaten eggs and mix well. 750 gm ‘ziti’ pasta – This is the long tubular pasta. It comes in different thicknesses, which one you go for is your choice I tend to use a medium sized one. A word of advice though, ’bucatini’ won’t do, as it is way too thin. 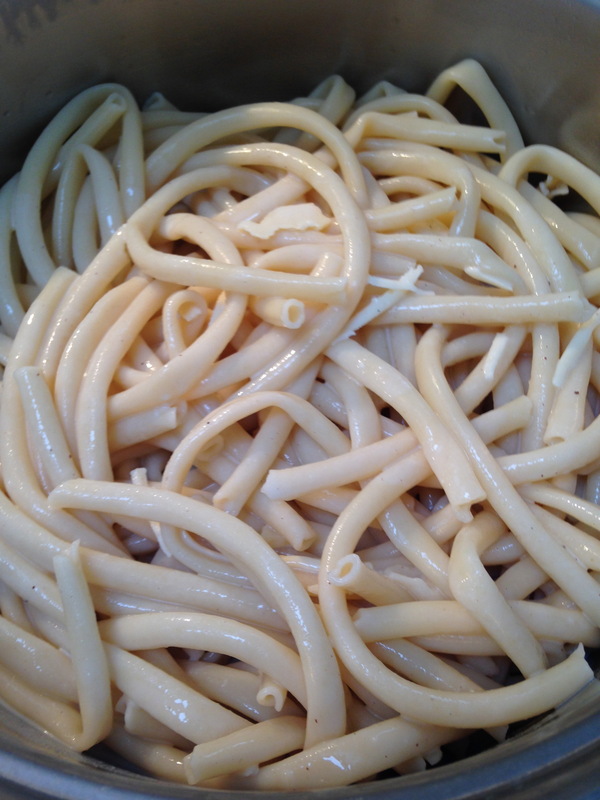 Cook the pasta in plenty of salted, boiling water until ‘al dente’ – it really mustn’t be over-cooked. Drain and set it to one side to cool – you need to be able to handle it ! It’s a good idea to toss it with a little olive oil when it’s cooling to stop it sticking. Take a large, fairly deep, oven proof dish – a large roasting tin is usually the best thing. Rub round the inside with some butter. 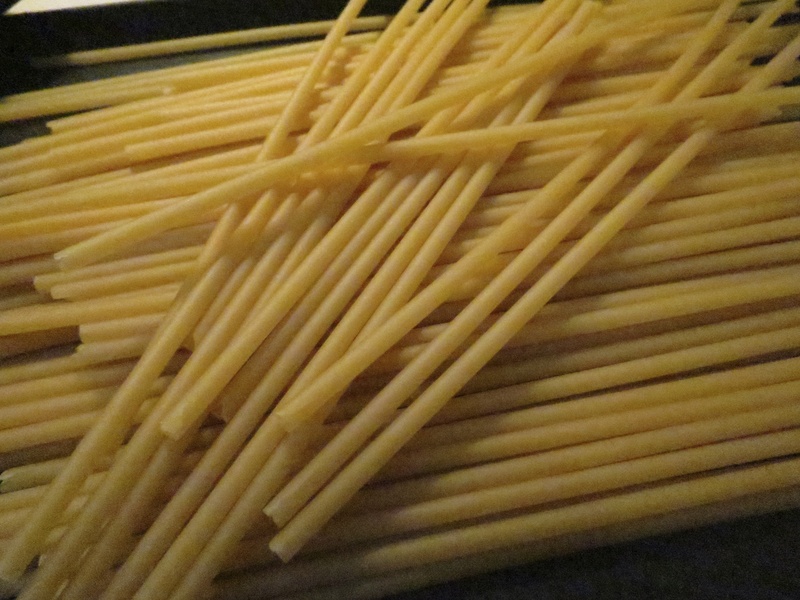 Line the dish or roasting tin with the strands of pasta, they need to be in fairly straight lines. 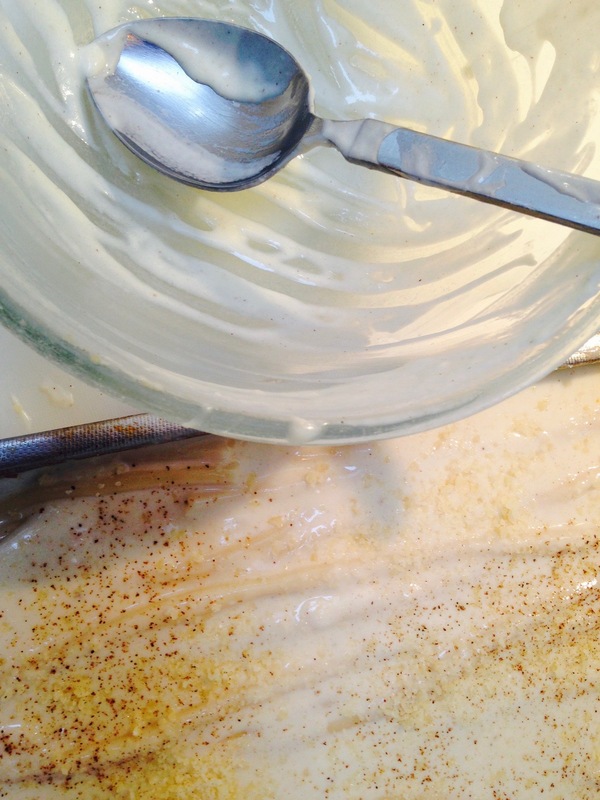 Once you have covered the bottom of the dish spread about a third of the béchamel sauce over. Now add another layer of the pasta strands. All the béchamel layer needs to be covered. The next layer needs to me the meat sauce. Spread this over that layer of pasta. 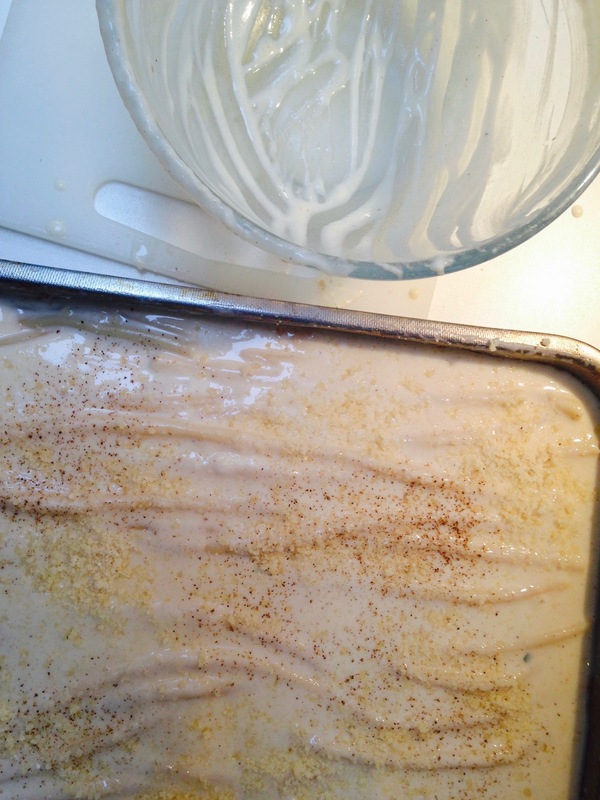 (A little tip is to sprinkle each layer with a little salt – it helps to make sure the pastitsio is well-seasoned). Top off the mince layer with the rest of the pasta, until it is completely covered and top with the remaining béchamel. Sprinkle with the grated cheese and bake in the oven at 180 degrees for about 45 minutes, until it has set and is fairly firm. Allow to cool slightly before serving, so that the pieces of pastitsio hold their shape. Serve with any good green or tomato salad. Think Craig at Craig’s Crockpot is going to appreciate this one ! Ha Ha. Absolutely! I’m getting a little freaked out now. I’m just putting together Italian Food Myth No. 4 and it revolves around not screwing about with lasagne or polpette. Supermarkets mainly so your post is spooky 🙂 Fantastic but spooky. Completely agree with you though Jane. Rick Stein is my all time favourite celeb chef (not counting Keith Floyd of course who was a God) but he does like to spout not touching classics and cooking simple food then he goes and messes with something we hold dear. Listen Rick, if I did Skate with Black Butter and put actual hazlenuts in it instead of nutty butter, you’d set the ghost of Chalky on me like a shot . well, aren’t you just a refreshing breath of crisp kitchen air. This has been the source of much of my ilk, angst, rabid mudslinging for the better part of the last 10 years. Classics are indeed classics, and shouldn’t be monkeyed around with. The top of my head explodes everytime I see a shepherd’s pie with beef mince on the internetowebbyverse. I’ve always been a fan of Greek cuisine (except the grape leaves thing… I feel like I’m munching on a stewed tobacco plug) and had pastitsio on several occaisions… you just can’t beat that beef and cinnamon combination. I’ll have to give making it at home a go. Thanks ! Couldn’t agree with you more Toby@platefodder ! It’s a rant that’s been festering for a while ! Feel much better now … ! Love it. Someone on Insta asked me why my recipe for yemista had meat in it? What it doesn’t? It’s not yemista love it’s vego stuffed veggies but don’t call it yemista. You know me I live to modernise but some things should stay the way they are. Seems we’re on the same page ! Literally! Love the image of Chalky’s ghost ! Ignorance is bliss as far as supermarkets are concerned. Another excellent post. You and Craig are kicking up the leaves as far as Greek and Italian cooking is experienced. I have watched Rick Stein cook Pastitsio using penne!! I was like a nodding donkey as I read your post until I got to the beef bit!! We have always cooked it using lamb mince – but I won’t a little lamb get between us, I too prefer to see classic recipes left alone. As for Waitrose version – steam is already coming out of my ears. I know ! I remember that episode too ! It’s a curious thing about this lamb/beef business. I can safely say that in 40 years I have never known anyone make either moussakas or pastitsio with lamb – but obviously some people do ! As you say – wont let that come between us ! 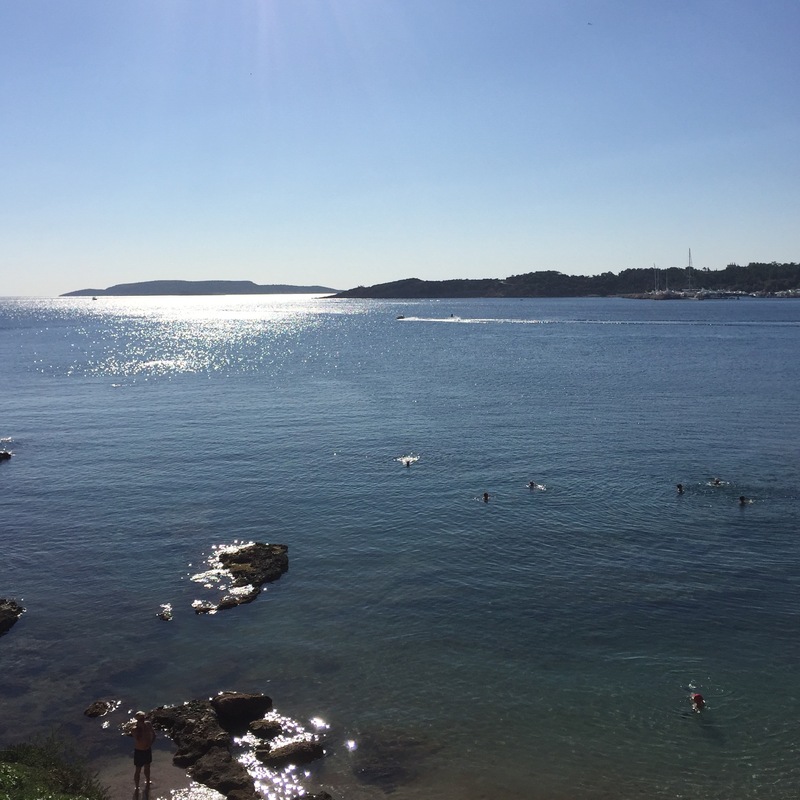 Thanks for reading the blog – much appreciated.